We’re back from CHICAGO…also known as ICE & SNOW STORM TOWN! phew!!! I’ll come back to that! THANK YOU to all of your for your wonderful anniversary wishes!!! You are SOO kind and I really appreciate them!! We enjoyed a WONDERFUL Anniversary in Chicago at one of our favorite quaint restaurants, Amber! They have amazing food!! During dinner, as our champagne was served, Mark surprised me with an AMAZING GIFT!!! He definitely outdid me in the gift department, though…he always does!! We had an incredible wedding the next day….right in the middle of the ICE, SLEET AND SNOW STORM that hit Chicago!! Phew…what a CRAZY day it was…and kind of exhausting and wild!! It started snowing..then went to sleet, I personally witnessed 6 accidents, then went to ICE…and pretty much stayed ICE for the rest of the day!! Let’s just say that a 10 minute drive was taking over an HOUR and I had to CHISEL inches of ICE off of my car to just get IN it…driving was another story….and it was a MESSSS!!!! Anyway…stay tuned for pictures of that (the wedding, not the ice)….but in the meantime….aren’t I just the luckiest girl?? 😉 I LOVE YOU, MARK! Congratulations Jess & Mark ! Jess, that Mark… he sure sounds like a KEEPER to me! 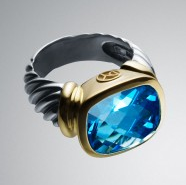 And, not that you asked, but my vote for the stone color of your ring is BLUE. But, blue is my favorite color! Here is to many more years together with your loving husband! You are one lucky lucky girl!!!! Glad you had a good 5-year Anniversary! how can you tell what color it is? gary’s right… how do you know what color it is. DORK.